The “Y2K Bug” was the threat which loomed like doomsday over the dawn of the new millennium. It was a clear sign of how entrenched modern life had become in the technologies we had adopted. However it was long before the new millennium that it became widely accepted that we live in a new age, living now in a digital environment (Arnold, 2004). Since, the ongoing developments in technology, a by-product of the information age, have continued to exemplify the most significant societal changes globally since the industrial revolution (Qualman, 2009, MED, 2007). Such technologies have made it easier to access information, store and relocate data (MED, 2005) and communicate across borders (Kolb, Collins & Lind, 2008). It is widely accepted that we have since moved far beyond the times and structures relevant in the past and now need to embrace the information age (MED 2007). 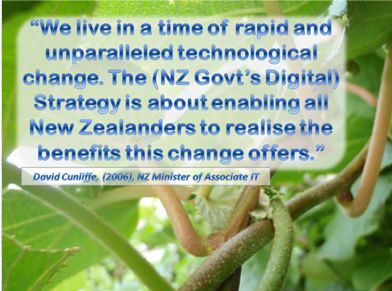 The New Zealand Government also embraces such change, ‘we are experiencing a worldwide revolution in information and communications technologies are occurring and is causing fundamental changes in our lives' (NZ Government, 2006). “A transformational general-purpose technology (such as these information and communication technologies) will by its very nature, cause or require, significant changes in society's structures and infrastructure” (MED, 2006, p7). At the forefront of these ICTs, particularly in recent years, social networking has been permeating daily-lives internationally (Cachia, Compano & Da Costa, 2007) and continues to receive increasing attention. Social Networks” may have become a “buzz word” in recent years, but they are far from a newconcept being fundamentally central and intrinsic to social interaction. The well known saying, "it’s not what you know, it's who you know" demonstrates the long appreciated recognition of the potential value of one's networks.. Ultimately, we as humans are social beings and our connections with others are what have necessitated our societies for centuries (Singer, 2007). I have attempted to use a rich range of multimedia to demonstrate the potential of varied applications and use of social media, in my research of social network sites use and integration in New Zealand small businesses. My research homepage is based within Google Sites, it can be found at http://research.assistnz.com and the wiki which supports as a collaborative glossary is found at http://wiki.assistnz.com -I have used wix.com to develop flash webparts within the site for the most part, alongside Google documents and services enabled by integrating Thinkfree's document editor in conjunction with blogger.com. Humans, as social animals, use the networks (or connections) within our social interaction to achieve tasks and obtain desires. Trade and social exchange have always existed, but social and technical connectivity have become the new imperative of the global economy (Kolb, Collins & Lind, 2008, p. 181). These networks of our social structures fundamentally underlie our exchanges of education, culture and learning. And incorporated with consideration of the technologies which are integrated and increasing embedded in our lives, the way we research, educate and inform are also up for question. However interestingly, Howick College has received some publicity recently for apparent controversy over their innovative initiatives of utilising student’s cell phones to store class work and complete field work (Sutton, 2010). Traditionally based network research has sometimes been intrinsically narrow in scope and often excessively constrained by its limits, making it increasingly inadequate for today’s reality where these are limitless, as early models developed defined limited properties and measures (Singer, 2007). Today, in our societies, the rate of change in our developing technologies is so prolific that it appears that we are forever just starting to adapt and manage one technology, when the next is already upon us. In such a dynamic and undefined context, the need for recognising resisting and stabilising forces increases (Kolb, 2002), calling for us to redefine our understandings of change itself. Incorporated with consideration of the technologies which are integrated and increasingly embedded in our lives, the way we research, educate and inform are also up for question. In order to enable efficiencies in my own life, I have adapted a somewhat unconventional approach to this submission. I facilitated my research process with the use of online tools and resources and have presented it through a website which has been developed specifically for these purposes. Further to this, I have utilised the open source or “Web 2.0” approach to ensuring up to date and accurate information, creating a wiki of my own which supports and supplements the documentation through use as a glossary. The interactive site design and presentation also encourages and enables the input of others to further supplement results. The focus of this particular review finds itself at the junction of three clearly disparate topics; New Zealand, our culture, people and businesses; small to medium businesses, entrepreneurship and other self employment (collectively referred to as SMEs); and social networking sites (SNS) and associated information and communication technologies (ICTs). When beginning to consider this review, it was unclear how this scope would influence or lead my focus, yet the expansive nature of the topics combined with the limitations of this submission, meant there was an ongoing and constant need to narrow the focus of the review. To provide context for understanding and identify clearly the reasoning of this focus and subsequent framework developed, each of the three topics; (NZ, SMEs and SNSs) has first been individually reviewed. 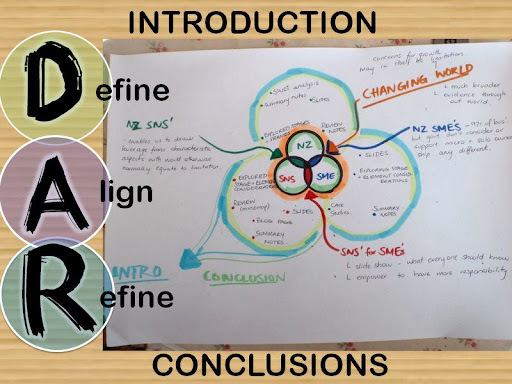 In order to enable me to demonstrate and integrate the various different overlaps within the disparate focuses of this review I have utilized a format type based on the concept of a Venn diagram, which I have referred to as the three rings. Initially utilizing this to identify and focus the insights gained, it also assisting in the overlapping and integrating of the various facets and disciplines. A framework from other previous research undertaken has also been adapted and utilized to through the review and consideration of this report. This, along with a select few reports with the greatest relevance to this research and context have been drawn upon to form the primary elements of this profiling review, and as such, mind maps developed to summarise key materials along with further additional resources and information can be found in the virtual version (access these by clicking here in the digital version or otherwise see the examiners menu under the main homepage). My personal interest within these topics initially is what has led me to this area of research and review and I have studied similar topics throughout my postgraduate studies. Intrinsically self motivated, I wanted to understand my role in the future connected world, and what it would mean for my industry particularly. The obvious changes in our societies and environment over my lifetime have irreversibly altered the world and context of my future. ICTs and SNSs represent a significant aspect of this changing world, but are only one piece of the puzzle. I completed a rather unique undergraduate degree, (Bachelor of Business and Information Management) and was one of the very last of the Human Resource majors to complete this combination of the degree before it was cancelled. The lack of numbers in enrolment within the management side of the degree demonstrates just how far we have to go before the integration with technology has really achieved its potential. Furthermore, as a female studying HRM, I have become acutely aware of the issues continuing to receive debate and disagreement in my industry and their direct influence on me personally. For example, the continuing struggle and issues which result from the divide between work/home and other inequalities in the workplace. Not content to accept the varying shortcomings of the nature of my “future working life”, I hope to extend perspectives and encourage collaboration in some way. There are increasingly obvious movements demonstrate a “new world” order as slowly we see the world population responding to some of the urgent changes called for by our environments. A video which won second place in a competition held by Argentinean RECREAR had an even wider exposure on YouTube, ‘The Lost Generation’ really encompasses this kind of movement and definitely resonated with me personally. Yet in order for considerable impact to be had in the mainstream, with the likes of the Facebook phenomenon, will require a fundamental shift in the understandings and beliefs held by all different areas of society[i]. Fundamentally, I believe that a leader is responsible for providing direction, not acting as a shepherd. Imagine what our day to day lives would be like if the books I first learnt from in my HRM papers had instead said; “As manager your role is to enable people to do what they enjoy.” Every part of the employment equation would differ if that were the case. When people work on things they like, that they are passionate about, you don’t need to motivate them –they want to do it and are intrinsically rewarded by doing so. It would be difficult to find debate against the concept of everyone benefiting if each of us attempted to live our lives with the things we are most passionate about in the foreground. Recognizing my inability to adequately cover this topic as a whole within this particular research, it has also become important throughout to ensure that innovative and creative research methods and approaches where also themselves important research review considerations. Adopting approaches to research and review which encourage us to adapt to varying perspectives and integrate alternative disciplines and fields would assembly being paramount at the point of over production where we currently find society. It should also be mentioned that it is the responsibility of each student, researcher and more broadly, general uses of these SNSs individually to take the initiative to embrace the ongoing integration of society and the economy and explore ways to better utilize and integrate the widely available tools and services which if managed effectively, can afford great efficiencies and potentially provide significant value to many levels, aspects and areas of our lives. In the virtual version, I have highlighted potential extensions, further reviews, links and blogs from a personal perspective and information which I have identified to be of potential value to anyone whom may take the time to review this report in an attempt to consider the value in exploring SNS and the subsequent integration, utilization and ongoing influences which result as such. The summary and overview notes from several very insightful and publicly available NZ produced reports help to encompass the essence and relevant aspects of the “Kiwi context”. Figure 2.0 emphasises the most relevant issues identified in this review, of the commonly experienced barriers to growth and development of SMEs and entrepreneurs in the New Zealand context (additional review can be found online). Figure 1 shows the positioning of the research within the three larger areas of which this review was focused, obviously central point of diagram outlines the kind of scope conditions of this review. (this venn model used through review to consider diff aspects/areas). Further details of my personal take and beliefs surrounding this area of research can be accessed through the online records.